Shiny and smooth - this is how hair is visualized in advertisements for various shampoos. However, in reality, the surface of hair looks far more uneven when viewed by physicists under microscopes. The hair surface looks much more rugged, as it is formed of ratchet-like, saw-tooth scales. Matthias Radtke and Roland Netz, in a new theoretical study reported in the European Physical Journal E (EPJ E), have shown that massaging hair can help to apply drug treatment - enclosed within nanoparticles confined in the channels surrounding individual hairs - to the roots of hair. A main reason for this is that the oscillatory movement of the massaging controls the manner in which the particles are transferred. Jürgen Lademann, dermatologist at the Charité clinic in Berlin, Germany, and his team discovered this phenomenon earlier by carrying out experiments on samples of pork skin. The phenomenon is also relevant at the microscopic scale where the transport on microtubules occurs in two directions among the cells in our body. On the other hand, the outcomes can also help to find better ways to prevent the transfer of harmful nanoparticles along the hairs to the wrong places. The researchers involved in this study developed a model in which a nanoparticle is transferred between two asymmetric surfaces. They moved one of the surfaces in an oscillatory manner with respect to the other surface using standard models of random motion. 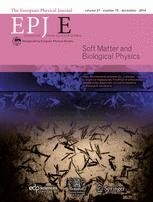 Using the corrugated surfaces, the researchers showed that when the hair is massaged, the nanoparticles are sucked into hair follicles due to the formation of channels between the individual hairs and the surrounding skin. This phenomenon occurs due to a “ratchet” mechanism. Additionally, the researchers altered the particle size, driving frequency, and the amplitude of the corrugated surface to determine the optimal transport conditions for different surface structures. They discovered that when the oscillation is switched from being perpendicular to being parallel to the resting surface, the ratchet effect is altered from a flashing to a pushing effect, respectively. Radtke and Netz also demonstrated that the parallel oscillatory motion largely improves the ability and speed of the nanoparticles to diffuse.